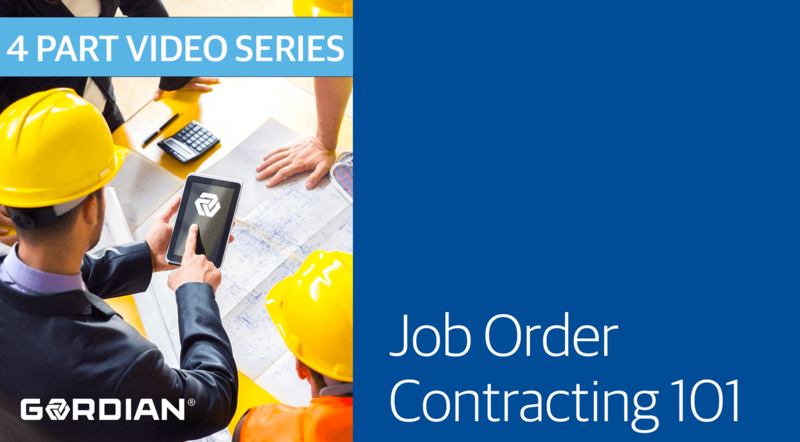 When is Job Order Contracting a Good Option? There is never enough time, never enough money or never the right people to complete your repairs, renovations and simple construction projects. Gordian’s Job Order Contracting solutions provide comprehensive data, robust software and unmatched industry expertise to help you maximize your resources and complete many projects with one competitively-awarded contract. View this infographic to identify the types of projects ideal for JOC. The most common questions we hear are below. long-term partners, resulting in higher quality work and a better experience. Contractors bid an adjustment factor to a catalog of tasks with pre-set unit prices developed using local material costs and labor rates. Once a contract is awarded, the contractor can perform a variety of projects. How do I access JOC? Contracting through national and regional cooperative purchasing networks. Run your entire JOC program in an intuitive software program. Access, track and manage your JOC program in an easy-to-use online platform. Manage the price proposal review process and set permissions for every user. Milestone tracking and reporting increase visibility and transparency for all key stakeholders and ensure projects stay on-track and on-budget. Have a transparent, audit-friendly paper trail including scope of work documents, proposal reviews and more. With instant access to your Construction Task Catalog® contractors can build accurate price proposals for your quick review and approval. Pre-set pricing eliminates lengthy and contentious negotiations. The catalog is easily searchable and allows you to add tags and mark your favorites to save time. No more sending emails back and forth. Gordian Cloud allows multiple users to work in the platform at once for easy scope development and refinement. Add comments as you work so that everyone is on the same page with reviews, updates and changes. Great for Project Owners. Great for Contractors. Our team is ready to help you implement and maintain a successful Job Order Contracting program so you can maximize your resources and keep your physical assets in their best possible condition. Contact a Gordian representative today.